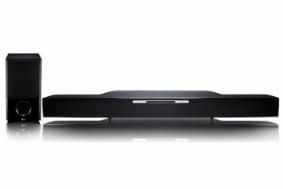 IFA NEWS: LG ramps up Blu-ray range with wi-fi player and Blu-ray soundbar | What Hi-Fi? The BD390 has full DLNA (Digital Living Network Alliance) compatibility, integrated wi-fi, 1 GB of built-in memory and BD-Live finctionality to make the most of all those BD extras. Users can stream music, video and photos from their home PC to the device. You also get 7.1 channel analogue outputs, onboard decoding of Dolby TrueHD and DTS-HD audio, upscaling to 1080p on standard-definition sources and DivX HD, MPEG4, MP3 and WMA playback. Further strengthening LG's position in the Blu-ray sector is the HLB54S soundbar with built-in Blu-ray player (shown). It too has built-in wi-fi, a wireless subwoofer, DLNA compatibility, 1080p video upscaling and a total of 430W of amplification. Designed as a 'plug-and-play' Blu-ray solution for those who don't want the hassle of home cinema separates, the sound has been tuned by hi-fi legend Mr Mark Levinson. Additional features include an iPod dock, two HDMI inputs for connecting additional sources such as a set-top box, games console or DVD recorder, and one-click access to YouTube. LG's BD390 goes on sale in the UK this month and the HLB54S will follow in November.